Alexander Skarsgård rides planes, trains, cars, a vintage boat and even a camel in a classified assignment that takes him around the world. From Hungary to Mongolia, the spy follows intel to execute a mission only he is privy to, braving the elements and spending a night under the stars. So fixated is he on succeeding that he seems almost oblivious to the splendour of the destinations, including the scenery of Lake Como in Italy and the majesty of Washington's Cougar Mountain. Despite the frenetic activity, he never loses his cool — or his luggage. Mongolia: Alexander faces the elements in Mongolia with Latitude while traveling by train, car, and camel. Alexander spends the evening under the stars before finding his mission objective and returning to Hungary. Accompanying our man of mystery throughout his adventure is an understated trolley bag, large enough to comfortably accommodate possessions and hardy enough to withstand careless tossing about. 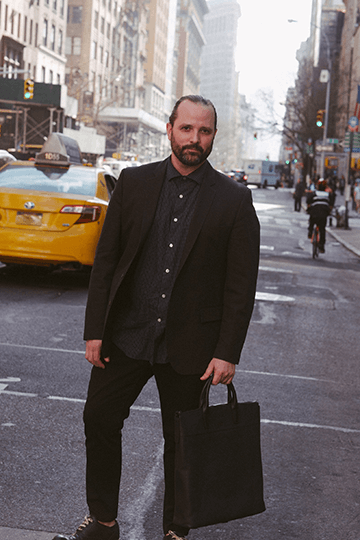 "I even tried to intentionally break the bag a couple of times with no success, of course," says the Emmy-winning actor who starred in the social media campaign celebrating Latitude, the new ultra-light collection by Tumi. Directed by Augustus Punch, the campaign videos see Skarsgård test the bag's superior design, quality, durability and functionality in all landscapes and climates imaginable as he travels the globe along a single degree of latitude. In addition to ease of handling, a refined aesthetic allows the bag to blend effortlessly into the sophisticated narrative. The premium, hard-shell solution to demanding travel is thanks to Tumi's innovative Self-Reinforced Poly-Propylene (SRPP Ballistic), a ground-breaking ultra-durable material fashioned wholly from a polypropylene composite. It is drawn to achieve maximum strength and woven into a fabric layer. Multiple layers are then consolidated into sheets and placed into a custom press that forms the Latitude shells. The material and process are similar to those used in sporting equipment and within the auto industry, testament to their robustness and resilience. Exceptionally light, strong and flexible, the Latitude collection was designed to be the pinnacle of form and function. Enveloping the unique structures is a range of cool and warm hues consecrated with sleek finishes. The aesthetic is intentionally timeless to tie in with the enduring construction — this is a bag that will follow you for years. "With travel becoming a standard in our everyday lives, you should be able to enjoy a smooth traveling experience and not have to worry about your bag failing you," says Tumi creative director Victor Sanz. "Customers want to ensure that precious belongings are completely protected. Elimination of such concerns during a journey is one of our key responsibilities. Customers today want well-built products that will stand the test of time — this is becoming the new definition of luxury." A frequent traveller himself, Sanz draws inspiration from all things new: places, people, meals, music and art. "I like to think you get your best ideas when you allow yourself to be open to new things and opportunities," he says. "At times, it can be the simplest thing that leads to the most creative ideas. Tumi prides itself on always pushing further, whether that means improving qualities such as lightness and durability to meet the increasing standards we set for ourselves or looking at how lifestyles and needs have changed, and addressing them with simple solutions. Most of the latter include new technologies and innovations that the customer never even sees but significantly better the product and experience." The lightest collection to date by Tumi, Latitude will be offered in a range of carry-on and check-in sizes, including International Carry-On, Short Trip Packing Case and Extended Trip Packing Case. It features all the elements that ease packing and travel, such as tie-down straps, multiple pockets for smoother organisation and a hanger bracket. Reinforcement rods provide additional support and rigidity, as well as keep the interior lining in place and maintain a tailored look. The soft-touch top and side handles are bolstered with plastic substructures and a patented X-Brace 45, crafted from aircraft-grade aluminium, serves to protect the telescoping handle tubes and absorb shocks while reducing the overall weight of the case. Security touches include integrated low-profile TSA locks and TUMI Tracer. Latitude will amicably follow its users with a newly-engineered wheel system that allows for stable multi-directional navigation. The Latitude campaign will run globally on various social channels, including Facebook and Instagram. Visit tumi.my/travel/featured/shop-by-collection/latitude.html to view the entire collection.